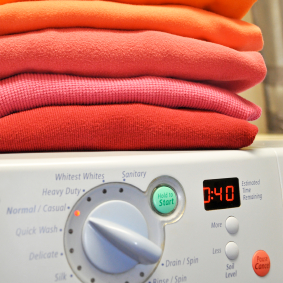 Hey, let’s talk about washing machines! Gather ’round, dear readers, as we spin thrilling yarns of engineering design, industrial espionage, and legal wrangling in the rough-and-tumble world of embedded systems design. C’mon, it’ll be fun! Once upon a time, we all loaded laundry into the top of our washing machines. In went the clothes and detergent, press a few buttons, and presto! Then one company — let’s call it Maytag* — stunned the appliance world with its shiny new front-loading washer. It was so… cool. It looked much more modern than Mom’s boxy old top-loading Sears Kenmore in Harvest Gold. It had a stainless steel finish, a big round porthole of a door on the front, and it gave off just a whiff of European je ne sais quoi. People who still beat their laundry on rocks by the riverbank wanted one, even if their old rock worked just fine. And so it was. Maytag couldn’t build the little gems fast enough. Never mind that the front-mounted door meant you couldn’t open the machine without spilling water on the floor, a problem the top-loaders never had. Or that the new design required more floor space, something else top-loaders didn’t need. Or that the stainless steel finish was hard to keep clean. No, none of that mattered. Everyone had to have the trendy, stylish, new-and-now design. Maytag developed a loyal following of design aesthetes who would use nothing else. Competition soon followed. Whirlpool, GE, Philips, LG, and the world’s other appliance makers all followed the new design trend, stripping away old colors and finishes and replacing them all with identical stainless steel. Doors migrated around to the front, like the eyes on a flounder. A small aftermarket sprang up for 18-inch pedestals to raise the new front-loaders to a comfortable height (something else the now-obsolete top loaders had never needed). You could even get stick-on appliques, or “apps,” to customize your machine. Third-party apps developers got rich (or not) riding on the popularity of the new front-loaders. Of course, the apps for one machine didn’t work on the others, but at just a few dollars apiece, they were immensely popular nonetheless. A trip down the aisles of any big-box home-improvement warehouse revealed dozens of competing brands, all looking more or less the same. The trend was so overwhelming that you couldn’t buy an old-style front-loading machine if you tried. Selling your house? Better replace your current washer and dryer with new front-loaders, or else risk losing the sale by looking backward and out of date. Maytag soon became the biggest appliance company in America, then the world. Between it and Korean competitor LG, they controlled 55 percent of the appliance market. LG sold 50 million machines in just one quarter in 2012, about one-third of the entire global market. Then the lawsuits began. Maytag sued LG, and vice versa, for not playing fair. Maytag says it took four years to design its first front-loader, while LG took just three months to do the same – a clear sign of copying, in Maytag’s view. No “ordinary observer” could tell the difference between the two, claimed Maytag’s lawyers. Not so, says LG. “Form follows function,” and because stainless finishes and front-mounted doors were obviously popular with customers, the company would have been foolish to ignore the prevailing fashion trend. Besides, the style just ain’t that complicated, hence the short design cycle. Maytag is simply attempting to “stifle legitimate competition and limit consumer choice to maintain its historically exorbitant profits,” according to court reporters. Maytag asked for an injunction and $2.5 billion in damages. The jury – convened just 10 miles from Maytag’s HQ – awarded the company “only” $1.05 billion. The ruling will send other appliance makers scurrying to their drawing boards, trying to come up with a design that (a) consumers like, and (b) doesn’t run afoul of Maytag’s lawyers. In short, they’ve got to find the “next big thing” and hope the market follows. Perhaps bottom-mounted-doors or touch-screen control panels? This case is just one example; Maytag has filed 19 similar lawsuits in other countries, all going on simultaneously as we speak. And in one final irony, Maytag uses LG parts in its washer. Is any of this a good thing? Depends where you’re standing. If you’re a Maytag fan, anything the company does is ipso facto good and righteous, possibly divine. If you’re a lawyer (for either side), the squabble is good business. If you’re a consumer, maybe not so much. The money both companies are spending is money that doesn’t go into new components, employee salaries, balloon-bedecked promotional displays, or discounts to the customer. Buy hey — nobody said justice was cheap. If justice this be. Few people involved in the trial seem to… y’know… care. The judge presiding over the case joked that jurors should stand up occasionally “to make sure you’re alive.” We might as well be watching theologians argue over the number of angels that can dance on the head of a pin. The twelve jury members and their peers just want to get their work done. They want to buy whatever product they feel like buying. They don’t care whether two devices look so similar that it’s illegal, or whether it’s merely the sincerest form of flattery. That’s what fashion and trends and styles are: they’re fleeting examples of what the public wants, and they just as rapidly disappear. Anybody want my old Pet Rock, laser disc, or 8-track player? Most consumers aren’t much bothered about their office equipment. People don’t wax poetic about photocopiers, fax machines, or an especially nice stapler. We treat them as functional appliances, and we neither notice nor care if they change their looks over time. Form follows function, and if the function is there, the form is more or less irrelevant. Our perceptions of right and wrong are funny things. Whom we favor depends on whom we know. Relationships and previous experience matter. Friends and family members are presumed innocent (except for weird Uncle Ralph; he’s a reprobate), while strangers with funny accents are easily imagined as heinous offenders. That’s why Justice is blindfolded. Atticus Finch never had it so tough. Change the name or city affiliation of a favorite sports team and most fans would stop rooting for them (as, in fact, they do). It’s not the players they’re cheering. It’s the tribal connection. Replace the Maytag name with another well-loved brand and watch how passions flag. How much would you care about the company’s fortunes then? Arguments about “look and feel” and “intellectual property” and “rounded rectangles” start to sound like so much theocratic babbling, unhinged from reality or practical concerns. How much of one’s perception is bound up in the totemic name rather than the merits of the case? If, indeed, there are any merits. Now that justice has apparently been done and a billion dollars is about to change hands, both sides are likely gearing up for another wave of appeals, countersuits, and PR blitzes. A new spin cycle, if you will. It used to be simple: We dropped in our dirty laundry and inserted a quarter to start the machine. It supplied the water and agitation. Now the agitation and dirty laundry come from an entirely different quarter. So what I wonder is, did Maytag actually copy and perfect some other design done somewhere else? You know, like maybe some kind of think-tank research place that maybe had a poor reputation for actually making money from its inventions? And what about the rounded rectangles on my Powerpoint presentation? Are those illegal now? I highly doubt that Maytag invented the front loading washing machine. Last time I have seen one, growing up in Austria, was in my grandmother’s bathroom back in the seventies. Moving to Canada in 2000 it felt like time travel to see those top loaders, huge energy wasters that would ruin all your clothes. Instead of washing them they bleach them at low temperatures. Thank goodness I could soon buy a Miele in Ottawa for the affordable price of two to three regular washers. And don’t even get me started on American dish washers. As for i-Pods-Pads-Phones, that’s a completely different matter. When my baby sister appeared, my mother insisted on a washing machine. This was a Bendix front-loader. The year was 1954. It lasted for at least 10 years, was bolted to a concrete floor (no suspension inside) and had to have an annual oil-change. So what is the fuss about?